This is a well annotated bibliography of over 200 publications containing photographs by Dr. Paul Wolff. 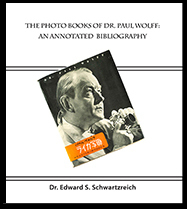 Until April 2015 PDF copies of the Paul Wolff Bibliography were available at no charge on this web site. The bibliography was published in April, 2015 (updated 2017)and is available from Amazon.com.